Forget about trudging up and down behind a walk-behind machine and aerate the largest grassed areas with impressive speed and efficiency by pairing-up your garden-tractor with the 45-0525 from Agri-Fab! It’s equipped with 10 aeration discs, so you can be sure it will do a super-thorough job; and it offers working-depth adjustment by way of a 102cm ballast-tray. Compatible with all garden-tractor models. 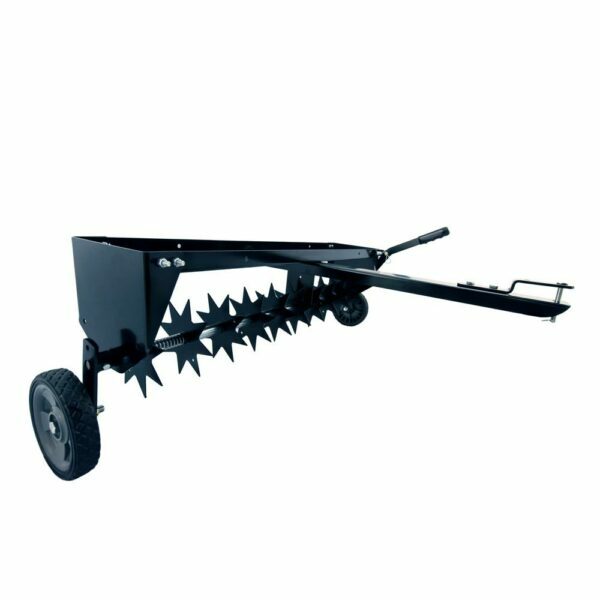 Invigorating paddocks, pasture and expansive lawns has never been quicker or easier than with the 102cm tow-behind Agri-Fab 45-0525 Spike Aerator. Its 10 sharply-spiked star-shaped aeration discs cut slice into the turf, with the resulting slits allowing fertiliser, air, water, light and nutrients to better penetrate the surface – you’ll notice a gradual but marked improvement in grass-condition. 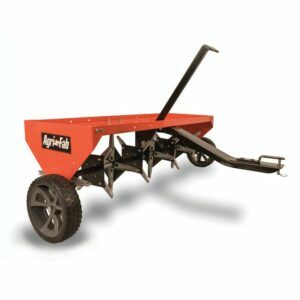 The working-depth of the Agri-Fab 45-0525 Towed Spike-Aerator by adding up to 45kg of ballast to the weight-tray, depending how on gentle or aggressive the approach that’s required. A transport-position means you can travel from site to site without the spikes digging-in; while a foldable tow-bar works to significantly reduce the storage-footprint. Unlike aerators which pull plugs of earth from the turf, this model won’t leave a mess on your lawn. 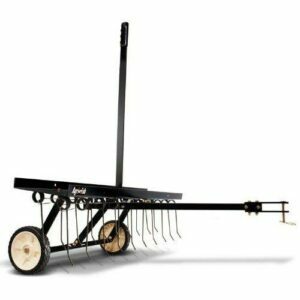 Supplied with a universal hitch-pin, it can be paired-up with garden-tractors from any manufacturer.